A free HTML5 Bootstrap 4 musical portfolio website template. Trendy options like tabbed content, search box widget in the header, google map are included in the box. 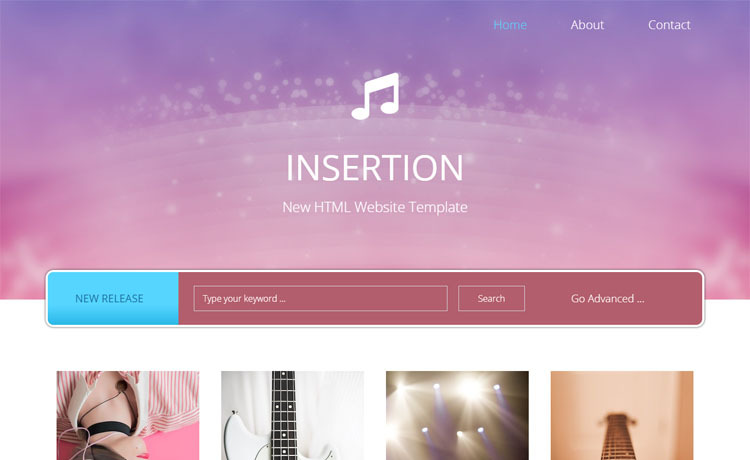 Insertion is a multi-purpose free HTML5 Bootstrap 4 musical portfolio website template for music, audio, singer. It’s a simple and clean template. Insertion has a multi-page layout and twelve unique layouts. Trendy options like tabbed content, search box widget in the header, google map are included in the box. Insertion has a Contact form UI with HTML5 validation. It has a well- structured code which will make your customization journey effortless and easy. Creating with Insertion is definitely going to be a smooth task for a newbie to professional. Thank you for downloading Insertion. Here are three recommended free HTML5 Bootstrap 4 musical portfolio website templates.